The shoulder is a ball and socket joint. A shoulder dislocation occurs when the ball falls off the socket. Shoulder dislocations occur from a fall, or as an injury during contact sports. When the shoulder dislocates the ligaments are stretched, and the labrum (cartilage disc in the shoulder) will tear. If the shoulder dislocates more than once then surgery is often advised. The type of surgery necessary will depend on the number of dislocations you had. The success rate of shoulder dislocation surgery is often high. Click here to see our newest video post about shoulder dislocations and treatment options. Shoulder dislocations result is a situation where the shoulder joint is now “loose”. Each shoulder dislocations makes it easier for the shoulder to dislocate again. The reason why your shoulder is dislocating will vary depending on why the initial dislocation happened. Shoulder dislocations can occur because you stretched your ligaments slowly over time (overhead sports), or shoulder dislocations can occur after a single traumatic episode (fall, tackle, etc) which has caused a ligament or labral tear. The ligaments and labrum contribute significantly to the stability of our shoulder. 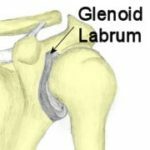 The ligaments are attached to the glenoid labrum… a cartilage disc around the socket of the shoulder. When you tear the labrum, the ligaments are no longer functioning well. This is how a labral tear can lead to shoulder dislocations. By far the most common form of shoulder dislocation is the traumatic, anterior form. This typically involves a collision on the ball field or a fall on an outstretched arm. The anterior labrum tears, a Bankart lesion (see image below) occurs and the shoulder dislocates. Some shoulders may spontaneously reduce, however, on many occasions, a trip to your local Emergency Room is needed to reduce the shoulder or put the shoulder back into place. Why Did My Shoulder Dislocate? ~ In most traumatic shoulder dislocations, the labral will tear. The labrum or the ligaments on the front of the shoulder, tear and allow the ball of the shoulder joint to jump over the edge of the socket and remain in that position until reduced. The most common form of instability of the shoulder involves trauma, a labral tear and a Bankart lesion. 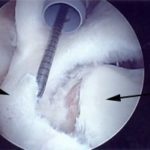 ~ In cases where the ligament has stretched over time — usually due to stress of pitching, swimming or overhead sports —the ligaments are simply not able to prevent the shoulder from moving forward and dislocating. ~ In patients over the age of 50, a common cause of instability or a shoulder dislocation is a massive rotator cuff tear. This typically follows trauma, but instead of tearing the ligaments or the labrum in the shoulder, all the supporting muscles tear and the shoulder slides out of place. Most dislocations in patients over 50 should be evaluated with and Ultrasound or MRI to determine the integrity of the rotator cuff muscles. Will My Shoulder Dislocate Again? Excellent question. By far the most significant issue after a shoulder dislocation is whether or not your shoulder will dislocate again. We refer to this as a “recurrence”. The younger you are when you first dislocate, the higher the risk of recurrent shoulder dislocations. Some studies have shown the recurrence rate can be as high as 50-75% in patients under 21 years of age. The risk of redislocation is also affected by the sports that you play. In contact sports such as hockey and football, your risk of having recurrent shoulder dislocations is very high. How Should my Shoulder Dislocation be Treated? By far, the most common treatment is a sling until you feel better. It is controversial whether or not the sling helps you “heal” your labral tear or diminishes the risk of re-dislocation. Most sports medicine physicians do not believe that the sling will reduce your chances of dislocating again in the future. The number one issue you need to be concerned about following a shoulder dislocation is whether or not the shoulder is going to dislocate again. The risk of having more dislocations is related to your age at the time of your first dislocation. The younger you are (under 30), the higher the risk that your shoulder will dislocate over and over again. The treatment for a shoulder which continues to dislocate is an arthroscopic repair of the torn labrum and ligaments which hold the bones together. During this minimally invasive surgery we actually anchor, or stitch the labrum back to the front of the shoulder. This is a picture showing a labrum tear with exposed bone. The metal probe is resting on the labrum. 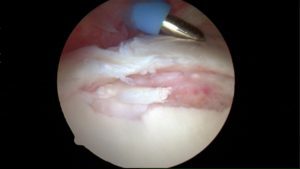 This is the same labral tear once it has been repaired and stitched back to the bone. Do I Need Surgery for my Dislocated Shoulder? In patients with more than one dislocation and a labral tear, surgery will be recommended to decrease the risk of future dislocations. The number of dislocations can influence the success rate of the surgery. Every time your shoulder re-dislocates, you are stretching the ligaments further. 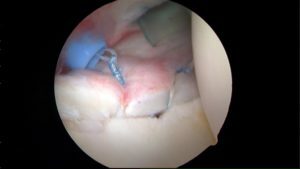 During the surgery, the labral tear is put back to its normal position and held in place by a number of sutures as seen in the pictures above. In patients with atraumatic or multi-directional instability, surgery is only indicated after failure of a lengthy physical therapy program. Many patients in this group will not require surgery. The risks of surgery include the risk of infection, recurrent instability (no surgery is 100% successful), nerve injuries, stiffness, loose or migrating hardware, and loss of motion. In cases of traumatic unidirectional instability, the success of an arthroscopic reconstruction is between 80-85%. The success rate diminishes if you have had many dislocations. The success rate also diminishes with a return to contact sports. In cases where your ligament simply stretched and you failed to improve with physical therapy, the results of surgery are less impressive than in the traumatic group. Shoulder dislocation success rates range from of 55-85%.We covered this issue of failure and what surgical options come into play in this video. Because of the complexity involved in treating shoulders which dislocate often, be sure to remember that volume matters! You should see a shoulder surgeon who performs a significant number of these procedures each year. IF you live in Dutchess or Westchester Counties in NY, click the link above to book an appointment online to let my 20 years of sports medicine experience benefit you in recovering from your shoulder dislocation.